America’s Incredible Pizza Co. started with a grand idea: To establish a wholesome institution where families and friends could affordably gather for great food, amazing games, and pure fun! As you might expect from the name, pizzas are the featured menu item. All the usual toppings (thirty in all), three crust types (original, deep-dish and thin crust), but if you don’t see what you want, just ask and America’s Incredible Pizza Company staff will gladly pop one in the oven to order. Pasta’s, salads, and desserts in addition to other items are also available. Everything is served buffet-style and a-la-carte food pricing is not available. Below are the latest America’s Incredible Pizza Company menu prices. Rick Barsness founded the company to right a wrong. He grew up without a traditional family unit because his dad wasn’t present. In spite of this, to most on the outside, Rick had it all. Personally, he was popular in part to a successful athletic career. He married a wonderful woman and they made a great family, and they had enjoyed financial and business success due to their Mr. Gatti’s Pizza franchises. For Mr. Barsness there was still a deep, personal longing to provide other children with the family atmosphere he had missed during his formative years. In 2002, that desire drove Rick to make a place focused on family fun, a simple menu everyone could enjoy at prices that were easy on the wallet. He succeeded with America’s Incredible Pizza Company. Today, AIPC is growing fast and employs over 2000 people. Since 2009, the company is based in Springfield Missouri although not originally established here. There are 8 U.S. locations and 3 locations in Mexico with a possible 17 additional international location expansion planned in the future. The trademark menu items are ice cream, pizza, salads, pasta and bakery goods. All served via the large buffet at each location. The pastas are the traditional favorites offered with meat sauce, marinara sauce or Alfredo, assembled from one’s choice of spaghetti or macaroni and cheese! All in all, there are 80 such combinations. Monday: Kids (4-11) Eat Free on Monday night with a full priced buffet purchase. Tuesday: 3 Attraction for only $8.00 with a full price buffet purchase. Wednesday: UNLIMITED play on attractions and video games with a full priced buffet purchase. Thursday: Double gameplay purchase up to $25.00 with the full price purchase of a buffet. Other Deals: In addition to the daily deals, discounts for military service (10%) and credits for academic achievements are given. 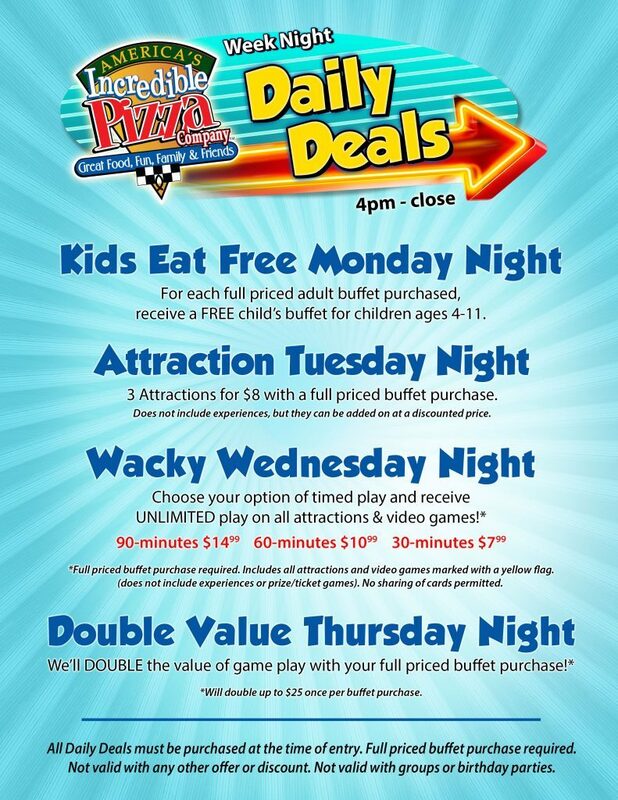 There are also coupons specific to each location which are also available making America’s Incredible Pizza Company a very affordable family outing! There’s no reason not to go to IPC for your next party or group outing. There are loads of attractions and great food for everyone! While the restaurant and game room are available to groups celebrating everything from Military homecomings and family reunions to church events, the most common group outings are birthday parties. Because of this, Increadible Pizza Company has designed four different price levels of prearranged birthday party packages. To book, or if one of the packages below don’t fit your group’s needs please contact AIPC directly via the link below. For more information about America’s Incredible Pizza Company, visit their official website.